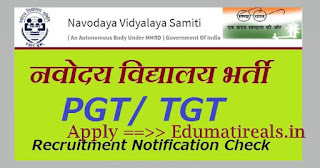 Jawahar Navodaya Vidyalaya has published Advertisement for below mentioned Posts 2018. Other details like age limit, educational qualification, selection process, application fee and how to apply are given below. How to Apply: Interested candidates may apply in prescribed application form with a recent passport size photograph and a set of self-attested photocopies of testimonials/certificates / ID Proof etc..to concerned Cluster Jawahar Navodaya Vidyalaya in which they desire placement in the cluster JNVs by Speed Post / Regd. Post or by Hand. The mode of selection wil be decided by the JNV. There may be Computer Based Test / Examination Followed by Skill Test and / or interview of the eligible candidates.